Rena Bulsterbaum is a Real estate broker and President of Sun Crest Realty Inc. in Deming. She is a member at First Baptist Church. Rena joined the board in 2002. Dr. Joseph Bunce is the Executive Director of the Baptist Convention of New Mexico and began his service on the board in 2006. Alan Chastine is owner of Pinnacle Investments, a real estate company based in Las Cruces. Mr. Chastine has served on numerous administrative committees at Calvary Baptist Church where he is a deacon and elder. Linda Dean has lived in Farmington, NM for 50+ years. She works for Conoco Phillips Company (35 years), serves on PAC Board of Directors. Serves as Hostess Chairman, co-lead Singles Ministry and DivorceCare facilitator. Hobbies are golf, baking, crocheting, movies, spending time with Randy. Larry Erwin resides in Clovis, NM. He is the owner of Erwin and Associates, where he serves as a financial consultant. He is a member of First Baptist Church, Clovis. Mr. Erwin has been the Chairman of the Finance Committee, Chairman of the Church Administrative Council, Deacon and Adult Sunday School Teacher. Mr. Erwin first joined the NMBF Board in 1987. He is now serving a second term. Robert Ewing resides in Albuquerque, NM and has served as a consultant and manager directing projects in engineering, software, and nuclear radiation detection. He has served on various advisory panels for the Department of Energy and the US Air Force in the areas of weapons and nuclear radiation He is a Registered Professional Engineer with a Masters Degree in Electrical Engineering from the University of New Mexico. He is an active member of Hoffmantown Baptist Church. James Francis is a certified public accountant at Johnson Miller and Company, Hobbs. He is a member at First Baptist Church. James has been on the board since 2001. Richard Gomez is currently a trustee and Administrator Business manager of the First Spanish/Fruit Avenue Baptist Church, Albuquerque. He has completed two terms as President of the NM Spanish Baptist Convention, and currently serves as Administrative Coordinator. Mr. Gomez is a pharmacist and has retired from the University of New Mexico having served as Director of Pharmacy Services and Coordinator of Investigational Drug Studies. He is a staff member of the Missions Division of the Baptist Convention of New Mexico and serves as the Director of Volunteer Mobilization/Mission Service Corps. Richard joined the board in 1999. Ken Goode has been Director for Central Baptist Association since 2001. Prior to this position, he served as a Consultant with the Baptist Convention of New Mexico. He is a member of Del Norte Baptist Church in Albuquerque. Rev. Larry Haslam serves churches in New Mexico as an Intentional Interim Pastor. Rev. Haslam served the SBC as Glorieta Conference Center Administrator for 30 years. Stanley Jones resides in Portales, NM. Stanley is the owner of SRG Development, LTD and involved in farming and dairying. He is a member of First Baptist Church, Portales where he has served as Trustee and as Chairman of the Finance Committee. Mr. Jones has been involved in funding and building churches for over 20 years. 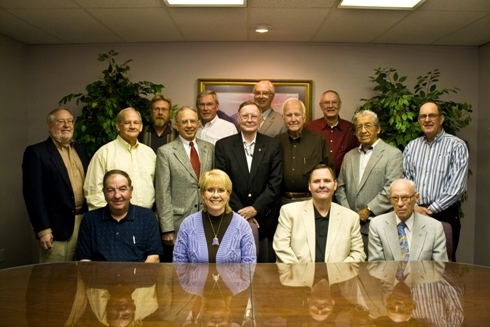 Mr. Jones joined the NMBF Board in 2007. Anne McCollum is a CPA with the firm of Newberry & Associates, Ltd in Gallup. She is a former New Mexico Baptist Foundation board member. She is a member of First Baptist Church in Gallup, where she serves as a Sunday school teacher and is active in the Women’s Missionary Union. She rejoined the board in 2006. Robert Martin is President of C.A. Properties and R.E. Martin Investments. A retired Brigadier General with the New Mexico Air National Guard, Gen. Martin is a member of Del Norte Baptist Church, Albuquerque. He serves as deacon and teaches adult Sunday School. Gen. Martin was elected to the board in 1994. Dwight Parker is owner of D & L Trucking, Parker Farms, and Parker Cattle Co. in McAlister, NM. He is a member of House First Baptist Church where he is the Church Moderator and the Chairman of Deacons. He joined the NMBF board in 2006. Randy Patterson is retired having served as Vice President of Exploration and Production for Yates Petroleum Corporation in Artesia. He is a member at First Baptist Church and joined the board in 2002. Charles Stockton is an investment counselor at Nations Bank Investments, Clovis. He is a member of Central Baptist Church, Clovis, where he has served as deacon and is currently teaching Sunday School. Mr. Stockton was elected to the board in 1998. Carroll Vaughn lives in Bloomfield, NM and is retired from the lumber business. He serves as a trustee with the North American Mission Board of the SBC. He is a member of First Baptist Church Bloomfield where he is a deacon and a SS teacher. He has previously been on the Finance, Personnel and Pastor Search committees of Bloomfield SBC. He joined the Foundation board in 2006. Ken Williams is the President and owner of Kenneth A. Williams Enterprises, Inc. and is involved in Real Estate development and financing. He is a member of Sandia Baptist Church, Albuquerque and rejoined the board in 2003.